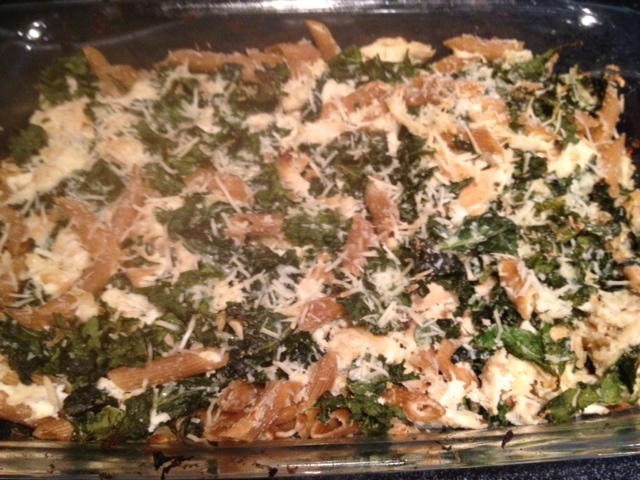 Chicken and Kale Casserole | Om nom nom! We got a big, lovely bunch of kale in our CSA this week that needed a job. I was contemplating something to do with it besides a soup, and found this casserole on Serious Eats (originally Martha Stewart, I think). It’s nice for a summer casserole – lighter and very bright. It made a ton of course, which was my intent…lots of lunches! This was pretty easy to make a bit healthier with whole wheat pasta, part-skim cheeses, and Smart Balance instead of butter. It’s pretty good. Maybe a little bit bland? In retrospect, some red pepper flakes or maybe more garlic. But a good use of huge quantities of kale!